Poor water quality will damage Silver. In particular Sulphur, high Fluoride, and low pH will react strongly with Silver and destroy conductivity and shielding performance. If color change or loss of conductivity occurs, DO NOT use tap water to wash/rinse your fabric, use distilled or deionized, reverse osmosis water. The perfect way to shield your ears. Comfortable enough to sleep in, and stylish enough to wear in public. High shielding performance silver jersey knit stretchy fabric gives excellent radiofrequency and microwave shielding. Made of double thickness 35% Silver fiber, 40% cotton, 25% polyester, and tested for 30 washings with no deterioration in performance. Ideal for cellphone shielding or any other activity when you need to shield your ears and forehead. Thin enough to fit under a hat or helmet. Durable and unwrinkle-able, washable too (no bleach). Silver provides anti-bacterial properties and suppresses odor. Folds small for easy transport. Pretty Silver/Gray color. There’s nothing worse than a winter chill blowing down your neck. A scarf is nice, but bulky and not always appropriate. This shielding Neck Warmer can be used to protect the neck and thyroid area, or pulled up to cover chin/mouth/nose, or it can even be worn on the upper head to shield brain, forehead, and ears. Made from a double layer of medium weight, stretchy, knitted cotton/poly/silver fibers for comfort and incredible 45 dB shielding. Gray color adds comfort and style to any outfit. Can be worn indoors or out. Choose adult or child size. Washing Instructions: Hand wash (104ºF) with TexCare, do not use bleach or chemical detergents. Do not tumble dry. Do not iron. "I bought the brain shielding cap....and I wanted to say THANK YOU FOR HAVING THIS PRODUCT. It helped stop the feelings I had from some device that was being used on me. I couldn't believe that the day I put on the cap the feeling and signal was blocked and it instantly felt myself again. I also bought the RF shielding poncho and few others products... I'm in awe on how these things are actually a cure to my suffering." "I was suffering from a brain-related health ailment and needed the silver-infused anti-EMF Brain Coat urgently to lessen my sensitivity to my surroundings! I have been feeling better now although I have not gained new employment since the health decline in December last year, but thank you so very, very much for expediting my order and shipment that time." "Very effective. I have to admit I felt a bit silly (and a bit skeptical) about purchasing this and wearing it but I have to admit it has made a difference. I wear it during the day and night. It has helped with both my chronic insomnia and anxiety. I read an article about how RF radiation pollution can cause a myriad of both mental and physical problems. In addition to this, I plan on purchasing more materials to shield home and car. Don't knock it until you try it!" Research links RF radiation with behavioral and cellular disturbances. Many people can actually sense the differences in the levels of "mind noise" from RF radiation. Provide your brain a quiet place without interference to your mental processes from RF radiation. Hand washable, choose your favorite color. Velcro adjustment strap means one size fits all. Adjusts from 50 cm to 63 cm (19.75" to 25") circumference. Union made in USA. A shielded cap is great, but how do you shield the back of your neck? This light weight mesh Protective Neck Flap can be added to almost any cap (works great with our Shielded Cap) to add radiofrequency shielding for the back of the head and neck. Attaches with adhesive-backed Velcro™ hook (included) so it is removable. Allows plenty of air flow so it’s fine for warmer weather too. Made with washable SwissShield Daylite fabric which is off-white. Great shielding from cellphones, wifi, smart meters and other radiofrequency signals for the head, neck, and shoulders. Normal looking, soft and very comfy… especially in cooler weather. Medium brown color goes well with most outfits, and can be used indoors or out. SILVERELL® quality, made with pure silver coated nylon and modal. 90% RF attenuation tested up to 8 GHz. "I LOVE the hooded scarf, it is beautiful and functional! I am really picky about clothing and I truly love this." Protects The Entire Head, Including Ears And Neck! Shielding your head just got easier. Slip this sheer and roomy headnet over a wide brimmed hat (to keep it off your face) and it will provide 99.7% shielding across the frequency range 10MHz – 3GHz and >94% at 5.6GHz. These frequencies include Wi-Fi, Cordless phones, phone masts, mobile phones and even TV and radio broadcasts. This extreme high shielding head net is made from 'Silver Supershield' double Silver-plated Nylon… providing the highest level of microwave shielding. Draw string at neck allows for comfortable closure. Quick to put on, easy to take off. One size fits all. (Hat not included, shown for illustrative purposes only) The highest shielding headnet on the market! No one said you have to give up looking fashionable to enjoy EMF shielding. This stylish women’s soft hat is perfect for cool weather. Wool blend outer, with a 100% silver coated mesh lining. Blocks radiofrequency radiation (cell phones, wifi, TV and radio broadcasts, for example) at 35dB from 30 MHz-3000 MHz. Brown pattern tones (which may vary from pictures depending on availability), goes well with most outfits. Can be worn indoors or out. Hand wash, sparingly. Here’s a great item to wear hidden under a wig or standard hat to shield your brain from radiofrequency (microwave) radiation. Attractive enough to wear alone as well. Fully elastic for a comfortable form fit. Provides ~35 dB shielding up to 10 GHz and beyond. Cranium cover slips on in an instant for all day or all night protection. Can be pulled down to cover part of the ear, or leave the ears completely exposed. The perfect RF defense cap for your brain… a whole new kind of mental block! Suitable for both men and women. "So far this stretchy yarmulke style hat has been very helpful in eliminating my headaches around wireless devices and cell towers." This shielded headdress can be worn several ways to provide coverage to the various parts of the head and neck. Very soft and comfortable against the skin, even for prolonged use. Suitable for daytime wear or while sleeping. Very thin fabric with a slight stretch, it can be worn under another standard style hat or scarf. Includes a long drape for the back of the neck which can be tucked inside the collar of your shirt, or left exposed. Think of it as a “ray dorag”. Provides 20 dB of shielding performance for RF/microwave radiation. Light gray color. Suitable for both men and women. How to Shield your Body from Magnetic Fields? Magnetic Shielding You Can Wear! Don't be fooled by the medieval look. This is a thoroughly modern solution to a thoroughly modern problem! Want To Make Your Own Shielded clothes? Click Here to view a selection of shielding fabrics you can use to make your own custom clothes, drapes, bedding and more! Now enjoy the comfort of pure silver knitted into stretchy cotton leggings. Hug fit and snug to the ankle, so perfect as long johns or pajamas for either day-time or night-time wear. 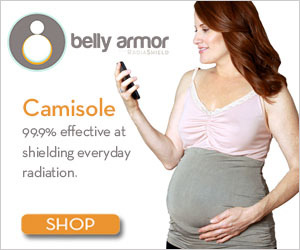 Provides 90% shielding against cellphone, wifi, and other radiofrequency radiation. Very natural looking white with distinct silver pattern. Washable. Designed for women. Let’s face it, shielded clothing is not usually very dressy. So what can you do when you need to dress up and still protect your lower half from radiofrequency radiation? Our Women’s Shielded Half Slip is a comfortable slip on undergarment that can be worn just like any normal half slip. Made entirely from good shielding Naturell fabric, it is cotton-based, washable, and cling free. Elastic waist, off-white color, simple design shields both front and back. Feel normal again wearing regular clothes. 19 inches from waist to hem. Another garment first from Less EMF! Specify size. For anyone who carries a cell phone, whether in your pocket or in your hand, radiation to the reproductive area is unavoidable. These comfortable briefs are made completely of unique Anti-Wave fabric with an elastic waistband and ample front cup. The fabric stretches and moves with you leaving you with no worries or irritation. Designed for men. 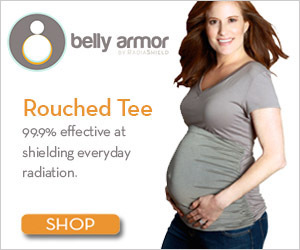 Instructions: Wear under or over clothes throughout your pregnancy, with larger side fully covering mama's belly. Note: This item is considered an undergarment and is not acceptable for return or exchange. Good RF shielding with Rayon and Silver fabric. Elastic waist band. Fly front with 1 button. Very simple design, suitable for men or women. Machine washable. Specify size when ordering: S, M, L, XL. Clean room type coveralls provide RF shielding to entire body. Zipper front makes getting dressed easier. Elastic at waistline and all 4 cuffs. Breathes well, and moves with your body. Uses specially-woven gray lining fabric containing corrosion resistant, micro-fine stainless steel fibers and provides >97% RF shielding! "RF Shielding for the Fashion Conscious Man or Woman"
Protecting the vital organs of the chest and abdomen from microwave radiation is now both stylish and comfortable. Easy button front and adjustable tie in the back to give that tapered look. Washable fabric is 30% stainless steel fibers, 60% cotton and 10% polyester providing over 50 dB of shielding performance, approximately 20 dB in ungrounded garment format. Reflects cellphone, wifi, and other wireless signals. Great at work, after work, and on the weekends too. Length: 60cm, chest 110cm. Gray color goes well with most outfits. Like a cross between a light raincoat and a lab coat, this shielding jacket is great for protecting the body and arms from radiofrequency radiation (think: microwave, cell tower, wifi, cordless phones, etc). Button front, 2 large pockets, belt, and fashion collar. Charcoal gray. 30% stainless steel fibers, 60% cotton, and 10% polyester and washable. At least 20dB attenuation, chart shows results from fabric testing. Select size. Scrub tops are comfortable and project an air of professionalism. This one, made with cotton-based SwissShield Wear shielding fabric, also provides excellent radiofrequency shielding to the upper body. Pure white, extra long, with elastic gather in back for a nice tapered look. Washable. Women’s styling. Great for both medical personnel or just lounging around the house. How can a woman shield her body at home or at work from wifi, cellphone and other wireless radiation while still looking fashionable and comfortable? Easy! The Shielded Ladies Smock is a simple pull-over style garment that goes well with any neutral outfit. Two large front pockets, zipper on one side, plus tie in the back make getting dressed easy. Ample room even for everyday activities and styling allows for most months of maternity as well (protects baby too!). 20-30 dB. Hand washable. Sizes run small. This unique apron is constructed using our special cotton based Staticot™ shielding fabric which is a highly effective E-field and RF shield, providing nearly 40 dB tested up to 40 GHz. 1000 Ohm per sq on the surface, so it is also great for static discharge and easy to make ground connections. We call it disposable, but you can certainly re-use it. Weighs only 3 ounces, and 4x5 inches and when folded. Stores safely for years, ready when you need it. Perfect for purse, car, suitcase, camping or home use. One side is conductive (the less slippery side) so it can be grounded. How Do I Shield My Hands? The Finger Faraday Cage! This has to be the easiest way to connect to ground. Whether you want to ground an Earthing mat, conductive cloth, drapes, shielding garment or anything else, simply clip the object with the alligator clip and plug the other end into a grounded outlet. Works great with Shielded Gloves above. Molded 3-prong plug (N. American) one end, alligator clip on other. Only the round ground lug is connected to the wire. The two flat blades are there simply to help hold the plug in the socket. 12 feet long. 18 ga stranded wire. No resistor. "I have developed electromagnetic sensitivity in my hands. I found your gloves and they work wonders on curbing the tingling in my fingers when I type or use my cell phone." Simply invert the pocket, trim that patch to size if needed, peel and stick into place. Nothing to remember and nothing to lose. Just make sure the patch is positioned between you and the phone. Laboratory tested, the Pocket Sticker deflects up to 99% of cell phone radiation away from the body. There are occasions when you need a bag which is small, sleek and elegant. This lovely small shoulder bag offers you all of this and the ability to shield cellphone radiation that would otherwise travel towards your body. Made of leather with a pebble texturing. The flap of the bag has an exaggerated envelope style with metal closure. The mostly rigid body of the bag is slightly rounded at the corners with a single roomy compartment. A delicate and chic gold colored metal shoulder strap chain attaches to the sides of the bag and can be removed. Will accommodate most sizes of phones and plenty of other personal items. Internally shielded on one side so phone still rings. 7½ x 5 x 1½ inches. Choose white, pink or black. "Protect What’s Yours from Prying Eyes"
Identity theft is rampant. This simple yet effective shielded passport jacket blocks the transmission of high frequency waves (13.56 MHz or UHF 860-960 MHz) used to read “smart” (contactless) passports. Prevents unauthorized access to your passport information. Passport Jacket Dimensions: 3-3/4 x 5-1/8 inches, fits most passports. Each jacket holds a single passport. Undetectable RFID barrier is embedded in the jackets, and adds almost no weight or bulk. Keeps your passport clean, safe, and secure. Passport slips in and out easily when it’s time to present it to authorities. Get one for each traveler. "Now With Washable Ex-Static™ Cover"
You can ground a useful (12" x 12") area with this professional quality heavy duty static control mat. Use it with static sensitive computer equipment or as a surface for handling static sensitive semi-conductors. Put it under your keyboard or laptop. More importantly, you can simply touch the mat with any part of your body to dissipate electric field build-up and equalize your potential with ground and reduce static discharge problems. Put it on your seat or on your desktop to reduce ESD. Can be trimmed with scissors to fit any area. Includes removable and washable Ex-Static™ fabric cover, and 5 foot grounding cord (no resistor, terminates with an alligator clip. If you want to ground to your electric outlet, get a plug to gator ground cord). Surface resistivity is only 105 Ohm/sq. Tough black rubber, about 1/16" thick, for years of trouble free service. This pad is for static discharge and grounding of radiofrequency shelding. We do not make any claims for health benefits of body grounding with this product. How to ground the vehicle? The Vehicle Ground Strap can be used on any car or truck. Simply affix the strap's clamp to the chassis of the vehicle and allow the conductive strap to dangle to the ground. Safe, durable and unaffected by the weather, the Vehicle Ground Strap maintains a secure ground and electrically neutral vehicle. Makes a great gift too. 18" long, 1 year warranty.